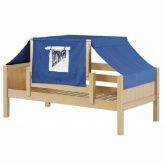 Why do we have toddler beds on a bunk bed website? Because our toddler beds can be converted into bunk and loft beds as your child grows. When it is time to make a change from toddler to twin bed, consider a toddler couch bed or toddler daybed. Add a tent for fun and it becomes a toddler tent bed. How’s that for motivation to move from the crib to a big bed? It’s really just a kids single bed but it becomes a toddler bed with guardrails and a tent if you choose. The top tents add an element of fun to the bed making your toddlers transition from crib to big bed much easier. We have tents in colors for boys toddler beds and girls toddler beds. Add bolsters and back pillows to cozy it up. The guardrails may be used until your child is ready to remove them. 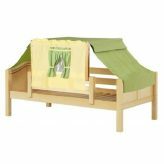 Or if they are eager to sleep lofted, this toddler bed can be converted to our lower loft which is much safer for the younger child and eventually a higher loft or bunk beds. This product is durable with built in safety features such as smooth finish and lock rock construction. Some toddler beds are fun like a car bed but it can only be used a short time. This single bed can be reinvented into whatever your child chooses making it a wise investment. If two young children are sharing a room, add a trundle below this bed so it sleeps two at a safe distance from the floor.